Often called New York-style cheesecake, this cheesecake recipe did in fact have its roots in New York. A retiring New York hotel chef of some note shared this recipe when he arrived in Florida with my wife’s family. It became a family recipe and they, in turn, eventually shared it with me. Cheesecake, you will find, has to be tended to from start to finish with care. You just can’t stick it in the oven and forget it otherwise you will have cracks, splits and a poor textured cake. By the time you have made one or two, you will have the procedure down and the work will seem easier each time. Prepare your springform pan. Use pan bottom to trace circle on parchment paper. Cut out circle leaving two inch-square tabs at the 3 and 6 o’clock positions (more on that later). Cut strips of parchment paper equal to the height of your pan and enough strips too around the inside of the pan. Spray the inside of the assembled pan lightly with non-stick vegetable oil spray. Wipe off excess. Place circle on the bottom of the pan and fold the little tabs up against the side of the pan. Line the inside of the pan with ths strips. A small spritz of the non-stick spray will help the overlapping strips stick together. Set aside. In a mixing bowl, combine Graham cracker crumbs and sugar. Mix. In oven- or microwave-safe bowl, melt butter, using just enough heat to melt butter - just melted but not hot. Combine butter and crumbs and mix well. I have a small coffee scoop measuring cup. It is made of plastic, has a square edge on the bottom and the sides are almost straight up and down and the bottom is flat. It is an almost perfect tool to form the crust. Place about half of the crumb and butter mixture on the parchment paper in the bottom of the pan. Using your plastic coffee scoop or a similar tool, smooth out the crumbs forming a layer about 1/8-inch thick. Mover the excess crumb mixture towards the sides. With the side and square bottom edge of the tool, press the crumbs against the side of the pan forming the side crust. Add spoonfuls of crumbs as needed to form the crust up the side of the pan about 1 ½ inches. Carefully place the prepared crust in the freezer for at least 20 minutes. In a large bowl, a stand mixer works best for this, beat the cream cheese until creamy. Slowly add the sugar in small amounts pausing between additions. Add eggs, one at a time, pausing between additions. Add vanilla and mix thoroughly. Pour into the prepared Graham Cracker crust. Use a spatula sparingly to smooth out the cheese mixture. Bake in a preheated 450°F. oven for 10 minutes. Reduce heat to 200°F and bake an additional 45 minutes. While cake is baking, prepare topping. In a medium bowl, mix sour cream, sugar and vanilla together until you have a snooth mixture. Set aside. When the cheesecake has finished baking, remove from oven and reset temperature to 500°F. Carefully pour the topping mixture on top of the pie filling; Remember, the center of the cake will be soft and easily damaged. Carefully smooth with spatula allowing the topping to meet with the crumb crust. Return to oven and bake at 500°F. for 5 minutes. Watch pie carefully while baking the last 5 minutes. The crust may get too brown in which case reduce the oven temperature. After 5 minutes, turn off oven and open door slightly. 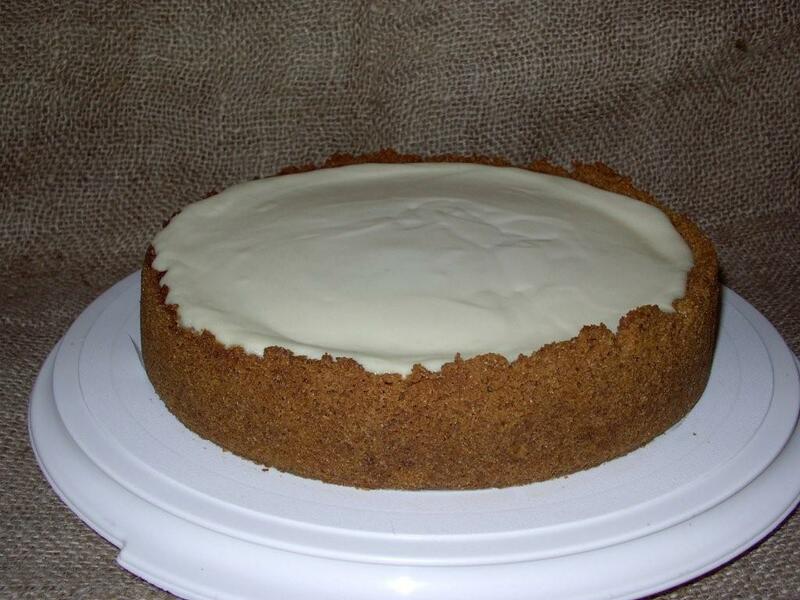 Allow the cheese cake to cool undisturbed in the oven for at least an hour. After the cake has cooled to room temperature, open the springform pan and remove the side. Carefully strip away the parchment strips. The little tabs at the 3 and 6 o’clock positions can be used to grab and pull the still soft cake from the springform pan bottom and onto the serving platter. As is, the cake is wonderful and will bring you raves from your guests. For variety, you might slather a thin layer of prepared cherry pie filing over the top or lightly spread the top of the cake with seedless raspberry jam. Prepared Graham Cracker crumb crusts come in light-weight aluminum foil pie tins. This recipe makes enough filling and topping for two pie-sized cheesecakes. The cheesecake filling is heavy. To avoid possible burns to yourserf and reduce the chance of the filling cracking, move and bake the cheesecake on a cookie sheet. Bake at 375°F for 20 minutes. Apply topping and return to 500°F for 5 minutes. On very dry days, it might help to prevent cracking if you have a roasting pan or jelly roll pan with a quart of tea-kettle hot water on the bottom rack of the oven when you are baking the cheesecake.